This January, several Trinity students dedicated the week before the start of the spring 2019 semester to volunteer work at a variety of sites in the Hartford area through the group known as the January Experience of Living, Learning, and Outreach, or JELLO. 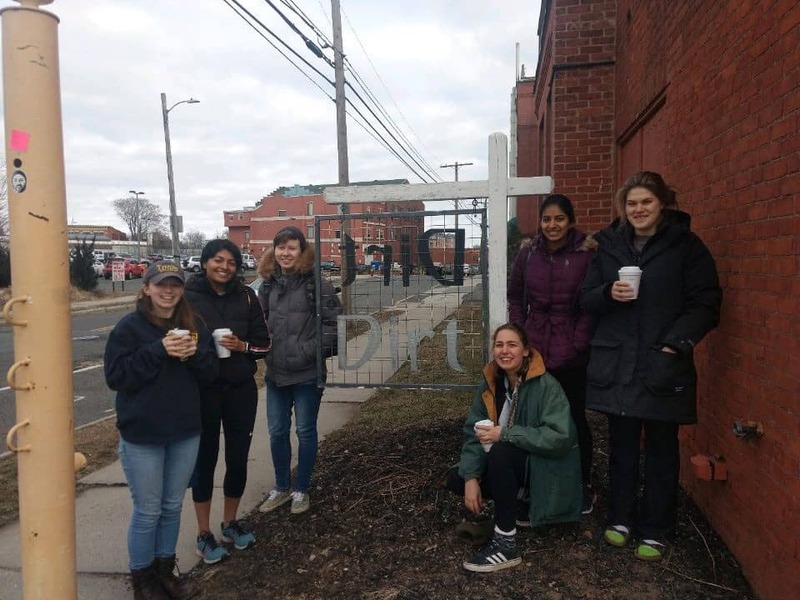 The JELLO Week of Service ran from January 14 to 18 and included volunteer work with Night Fall, Trinity’s Cinestudio, Journey Home, Grace Episcopal Church, Church of the Good Shepard, and KNOX, Inc. Some of the projects involved cleaning churches, helping local students write their own stories at the Trinity Day Academy, and helping with food pantry distribution. 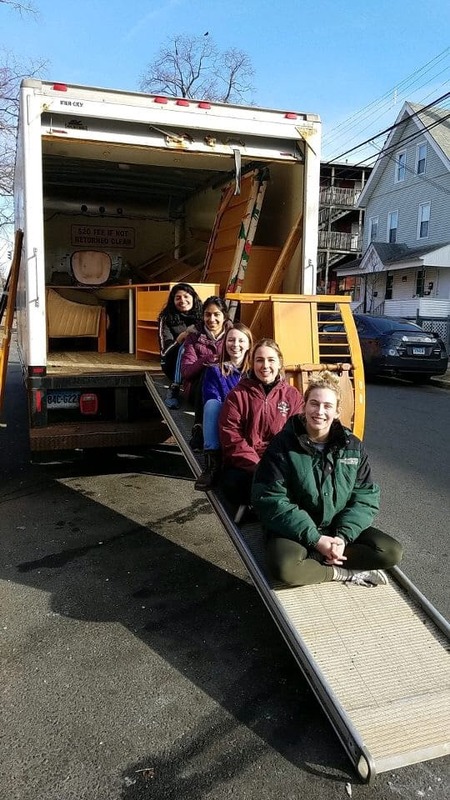 Amodini Katoch ’22, Tulsi Sumukadas ’20, Hazel Robertson ’19, Alison Cofrancesco ’20, and Sarah Kennedy ’20 volunteered for Journey Home in January. Amodini Katoch ’22 and Alison Cofrancesco ’20 participated in the Week of Service for the first time this year. “Back in high school, community service was a big part of my life, so it felt right to continue this passion on campus,” Katoch said. Cofrancesco decided to participate since she had heard great things about the people and the program from working in Trinity’s Office of Community Service and Civic Engagement during the semester. “It’s nice to do something to get more involved with Hartford,” she said. The history of JELLO, which is now a staple within the Office of Community Service and Civic Engagement, goes back more than a decade, when members of Trinity’s Chapel Council first came together to run a series of faith-based community service projects in Hartford between the fall and spring semesters. The program was eventually expanded when Nichola Clark ’12 contacted Office of Community Service and Civic Engagement Director Joe Barber about conducting service projects in areas outside of Connecticut, leading to work in Washington, D.C., Trinidad, and Vermont. Hazel Robertson ’19, Amodini Katoch ’22, Nat Bush ’19, Alison Cofrancesco ’20, Tulsi Sumukadas ’20, and Emily Wertheimer ’20 volunteered at Night Fall during January break. While planning for the 2013 JELLO Week of Service, Barber and the students involved asked themselves, “Why don’t we focus this on Hartford?” Ever since, JELLO participants have focused their time on local Hartford organizations during January and have worked to create lasting partnerships. This has allowed the group to continue to serve the community during the academic year and during the Bantam Beginnings pre-orientation program for first-year students. Barber said that he hopes students will get to know more members of the Trinity community through JELLO, while also getting more involved with the Hartford community. Farrar said that the organization volunteers at Place of Grace Food Pantry weekly on Wednesdays and Thursdays during the fall and spring semesters. Additionally, the group volunteers on Saturdays with many different Hartford organizations, such as the Wadsworth Atheneum and the Northside Institutions Neighborhood Alliance (NINA), as part of “Service Saturdays.” Farrar said, “Anyone is welcome to join on the Service Saturdays and we promote around the entire school because each service activity is different, and each week could catch someone’s interest who might like to be involved.” Typically, Trinity has about 10 students participate in each of the weekend events. One of this year’s Week of Service participants, Sarah Kennedy ’20, explained that she enjoyed getting the chance to know people from the Office of Community Service and Civic Engagement through the volunteer work. “I think the program demonstrates there are so many different projects going on in Hartford and there are so many ways you can contribute based on your skillset,” she said. Students interested in volunteering at the Place of Grace Food Pantry or Service Saturdays this semester may contact madalyn.farrar@trincoll.edu for more information.